This June 6, 1912 Vintage Leslie's Newspaper is complete and in very good condition with slight creases, dirt, stains & tears. This newspaper measures approx. 10 1/2" x 16" and has a center crease through the newspaper going lengthwise. The front cover features "Goodbye". 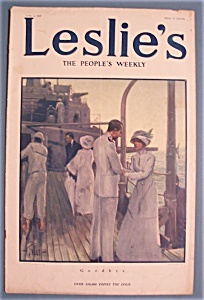 This newspaper also features: "Notable Banquet Held By Democratic Women, Bandits Hold Up A Train And Steal $200,000, The World's Greatest Naval School, At Sea With Uncle Sam's Bluejackets, How Torpedo Boat Destroyers Do Their Work & The Imperator, The Largest Vessel In The World".